Here is an easy to make and extremely delicious Hawaiian dessert that will keep the party going! 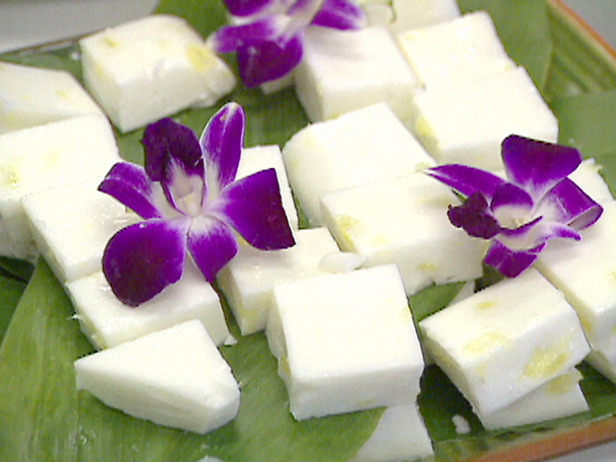 Haupia is a coconut pudding that can be served as an actual or pudding or in its more common form, pudding like cubes (shown below). This dish will only take about 10-15 minutes to prepare, however it will take 2 - 3 hours to chill the dessert before serving. Add coconut milk, sugar and salt to a saucepan and stir over medium heat until the sugar and salt dissolves. Reduce heat to medium low, add shredded coconut and cook for 5 minutes to soften. Make a slurry in a separate small bowl by gradually whisking 1/4 cup water into the cornstarch. Whisk slurry into the coconut mixture and allow to reduce and thicken until it is the consistency of yogurt. Transfer to serving dishes and chill until ready to serve.